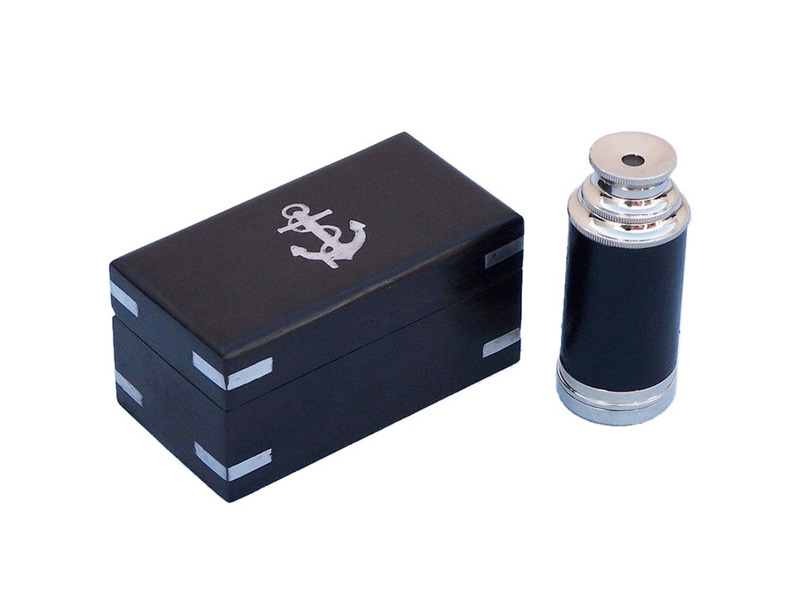 The Hampton Nautical 7” Scout's Chrome - Leather Spyglass is a great gift for the young nautical explorer in your life. This small chrome spyglass is pocket sized. When fully expanded it reaches 7” in length and 3.5" when collapsed. The handle of this spyglass is a stitched black leather. This spyglass also comes with a solid chrome cap to protect the lens. Simply adjust telescope tube length to bring into clear focus. The 7" spyglass is shipped in a beautiful hardwood case. The box is a smooth finished hardwood with a gloss finish. For the nautical enthusiast and collector in your life, give one of these brilliant antique nautical instruments and complete their collection. Invented in the 16th century, the nautical telescope came to be an essential tool to sailors and pirates alike, allowing them to cruise across the seas with an eye towards what awaited in the distance. Designed with historic accuracy, this antique brass telescope fits perfectly amidst nautical décor, as well as making a fabulous conversation piece in any room or office. Collectors will love the wonderful detailing of this nautical telescope, from the classic style and elegant wood craftsmanship, to the lenses that give a remarkable view. No collection is complete without a true nautical telescope, and with Handcrafted Nautical Décor’s eye towards recreating the historic wonders of the sea, this telescope will give you a new view of the world.